I've had a busy and productive 2 weeks since my last WIP post! This past week has been all about the bags.....the For Pleat Sake bags to be exact! This is a tutorial from Lisa Lam, and I made two of them!! One for practice, and to work out the kinks I usually put into things! love the Echino fabric, and I added a much needed zip pocket. For the second one, I put in 2 zip pockets! I also interfaced the outer fabric as well as the lining to give it more of a substantial feel. I also added an invisible magnetic closure. Love this fabric so much! Are those glasses not the cutest thing?? I love the red leather handles too! As I said, two 7" zip pockets and I also added a key hook. I think the lining is a Japanese print, but I didn't have any of the selvage to check! it sure is gorgeous though! I think I am done with bags for a long time now! Another Curve It Up QAL block was ready to go this week, and once again, another spectacular take on a traditional block- this one is rail fence! Isn't it amazing what a curve will do! I'm sure liking this Bella collection by Lotta Jansdotter too. Naturally, Christmas crafting has to work it's way into the mix as well! I did a little wall hanging from a pattern by Sonja @ Artisania, and it can be found in Quiltmaker Nov/Dec 2012. It was a near disaster! You can read about it here! I also have started a new table runner. The Sunbonnet Sue blocks are from a pattern by Jennifer @ Sew hooked. The Ho! Ho! Ho! in the centre is just simply pieced, with a strip of ribbon for the exclamation mark. I just need to do a bit more quilting on it, bind it, and call it a finish! I am working on a block for Nicky in our Star of Africa bee! Almost Nicky!! It is supposed to be Anne of Green Gables! I tell you, these ladies raise the bar every month! Other than the Curve It Up QAL, my UFO quilts are sitting idle on the sidelines until after Christmas probably. Unless I get a spurt of energy! As if! We will be having our second meeting of the Saskatoon Modern Quilters Guild on Sunday! We are certainly in the growing stages, but it is so nice to meet local quilters. 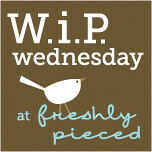 Today, I'll be linking up with Lee @ Freshly Pieced. And with Monika @ The Needle and Thread Network. I just love those Bella curves! And your Christmas tablerunner is going to be adorable! Love the bags, love it all! You are so productive!! Your second bag is even more fabulous than the first and it was lovely! You have been churning out projects at a rate of knots! Amazing is right! You've been busy! The bags look great, I love the added zips, and the zipper pull is adorable! I love the glasses on the reindeer. How adorable! And that curved up rail fence is great too. There are so many tempting projects in blogland that I just want to do them all, and I know that I can't. Your stuff looks great! Love the black and red bag! The leather handles really is the icing on the cake! everything is wonderful...but I love the little bear! You've certainly been busy, and everything you've done is just wonderful! Oh wow, those bags are gorgeous. Who doesn't love deer wearing glasses! I am loving the Quick Curve Ruler blocks I am seeing around the place - very tempted to buy one but the shipping to NZ is so expensive. The bags are smashing. well done! The bags look really great, Echino prints are really perfect for that kind of thing, aren't they? I really like that bear wall-hanging. I was back and forth on buying the magazine (since I haven't made anything from the last quiltmaker's magazine I bought), but that's such a great pattern. So busy! What a variety of projects. Those bags are great and the fabric designs are ones I have never heard of before. Anne of Green Gables is cute. It is so neat to see what Sun Bonnet Sue is up to ;). One project nicer than the last one! Those bags sure look nice, you have the most interesting fabrics. Love love love your curves block! I know I have that ruler coming to me for Christmas, and I can't wait to join the QAL. Your block is wonderful!